UPDATED, March 19, 3:00 P.M. It was the merger that rocked the South Florida residential brokerage scene. When it was announced that The Jills of Coldwell Banker and the Zeder Team, previously of EWM Realty International, would be joining forces, the industry was abuzz with theories as to why. Was it a public relations move? Is it just about boosting each team in top markets such as Miami Beach and Coral Gables? In early March, the two teams announced that they would become The Jills Zeder Group under the Coldwell Banker umbrella. Both are powerhouse producers in Miami-Dade County. According to The Real Deal’s ranking of top brokers and broker teams in the county, The Jills were No. 1 for both condo resales, totaling $139 million, and single-family home sales reaching $166.2 million. Zeder’s team was next for single-family home sales, with $129.9 million in sales. 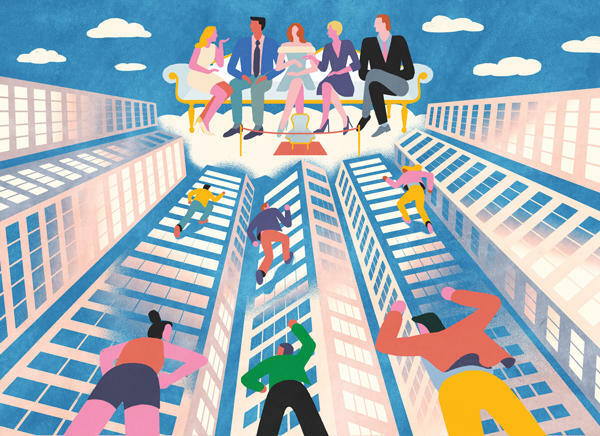 The teams within the newly formed group will stay in their respective wheelhouses, they said, but with a beefier collective Rolodex of wealthy buyers. For The Jills, which includes Jill Hertzberg, Jill Eber, brother and sister Danny and Hillary Hertzberg, and Eber’s sister, Felise, it gives them a familiar name in Coral Gables and the surrounding areas. And for Zeder, whose team includes her kids, Nathan Zeder and Kara Zeder Rosen, they gain the same in Miami Beach, Indian Creek, Golden Beach and more. When it came to choosing a brokerage, Hertzberg said she didn’t consider leaving Coldwell Banker, and she would not have joined EWM. Zeder was with the Coral Gables-based brokerage for more than 16 years before she and her children decided to join Coldwell Banker this year. Whether it’s by merger, affiliation or old-fashioned recruiting, a number of Miami’s top brokers remained on top by increasing the number of agents they work with and by expanding geographically. TRD ranked top brokers by analyzing sales of single-family homes and townhouses that closed in Miami-Dade County last year. Off-market sales were not considered. Agents were credited with representing listing and buying sides, and agents who represented both sides received credit for both. For instances in which multiple listing agents or teams at the same firm were credited with closing a deal, the dollar value of the sale was divided by the number of agents or teams who handled the transaction. If a sale was co-brokered with an agent or team at another firm, each agent or team was given the full dollar value of the sale. 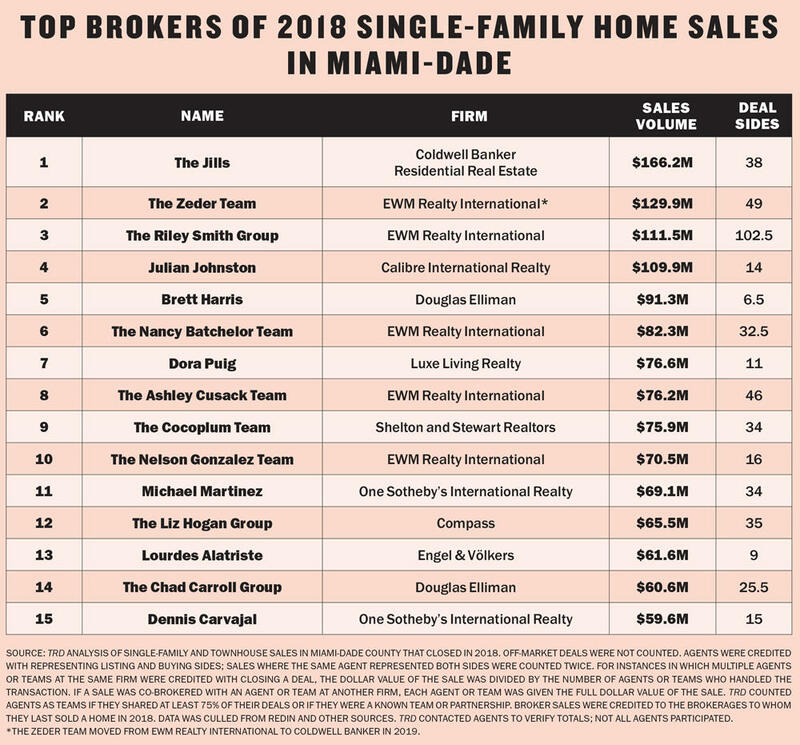 For Riley Smith of EWM, whose team was the third top producer for single-family home sales last year, with nearly $111.5 million in sales, 2018 was the year he covered more ground in South Florida. Smith broadened his coverage area from Homestead to Fort Lauderdale, and roughly doubled his team size, up to 21 agents and nine office employees. The lower price points, between $300,000 and $600,000, proved to be a good bet. Last year, 6,303 single-family homes sold in that range in Miami-Dade, up 15.7 percent year-over-year. And luxury sales also rose, up nearly 16 percent, to more than 1,000 sales of houses priced at $1 million and up, according to the Miami Association of Realtors. “Miami is dealing with an abundance of supply at the high end. Looking at the data, we surmised that the majority of the properties listed on the market would be sold in a 12-month supply” if priced correctly, said Douglas Elliman’s Bryan Sereny, who, with Bill Hernandez, closed $76.1 million in sales last year, marking the third top-selling condo team in the county. A number of top agents in Miami are optimistic about the market, remarking that they’ve seen a surge of sales of ultra-high-end properties in recent months. In February, a waterfront mansion on the exclusive Indian Creek Island sold for $49.9 million, setting a new record for single-family home sales in Miami. The property was sold by Elliman’s Alexander Brothers (see our full profile on the brokers on page 36). But the market was still challenging, said Nelson Gonzalez of EWM. “The demand was starting to pick up, but we still had a lot of inventory,” he said. Gonzalez closed $70.5 million in single-family home sales and $22.3 million in condo sales last year. “But demand now is definitely, definitely ramping up tremendously, and the cream of the crop inventory is now selling,” Gonzalez said. Lourdes Alatriste of Engel & Völkers said her company’s strength in foreign markets helps her secure clients and close deals. Alatriste closed $61.6 million in single-family home sales last year, earning her thirteenth place in Miami-Dade. Her strategy is to connect with agents in other markets, such as Chicago, New York, California and Colorado. She also advertises in Mexican real estate magazines to attract Mexican buyers who are looking to park their money in the U.S. now that President Andrés Manuel López Obrador, a leftist politician, is in office. Elliman team Eloy Carmenate and Mick Duchon, ranked No. 4 with $71 million in condo resales, said they will go wherever is needed to close sales — including New York, Los Angeles and Aspen, Colorado. A good portion of their business is off-market, Duchon said, which is not included in TRD’s ranking. “Now we’re starting to travel more, adapt and change our business model,” he added. Luxe Living Realty’s Dora Puig — who ranked No. 2 for condo sales, with $112.7 million in sales volume, and No. 7 for single-family home sales volume, logging $76.6 million — is also seeing the influx of far-flung buyers. She’s targeting specific buildings with out-of-state mailers. 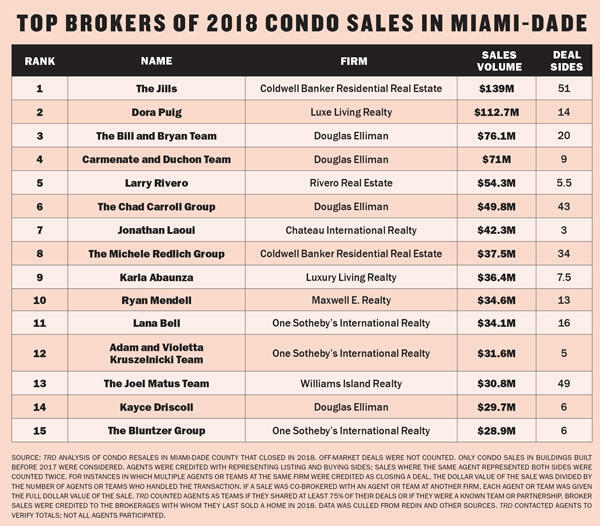 Correction: This ranking has been amended to reflect that Douglas Elliman’s Bill and Bryan Team ranked third in condo sales, with $76.1 million in dollar volume. The Carmenate and Duchon team placed fourth in condo sales, with $71 million.